Fixing a corrupted USB flash drive using cmd works in some cases, but not always. To prevent any data loss from using chkdsk commands, you'd better firstly recover data from the corrupted USB flash drive. Chkdsk is Short for "check disk", which is a basic Windows utility that scans a hard disk, USB / external drive for errors and can fix file system errors for free and repair or recover data on the drive if necessary. You can run Check Disk from a command prompt or within other tools. When your USB drive is corrupted, you'd better firstly recover data from the corrupted USB flash drive. For this, you need a professional data recovery software, which can help you recover data from a corrupt or formatted hard drive. Bitwar Data Recovery is the powerful data recovery software which can help you easily recover deleted data from the emptied Recycle Bin, digital cameras, memory cards, CF cards, SD cards, USB flash drives and external hard drives, and etc. the program can be applied in various data loss situations. For example, system crash, hard drive formatting, virus attack, partition loss and other unknown reasons in Windows. Anyway, some day when you're unfortunately facing data loss issues, feel no hesitated to download this software to help you. 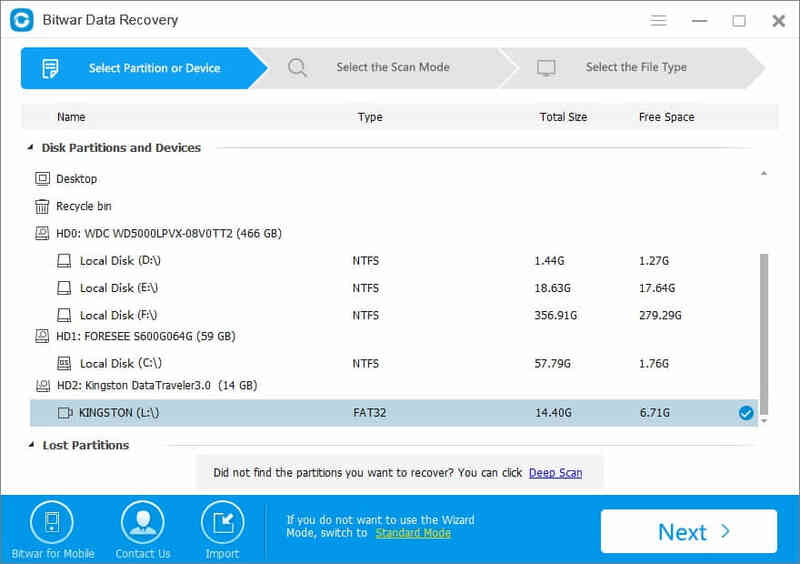 Free download Bitwar Data Recovery Software on the computer by clicking the download icon below and then install it to a normal partition. Then connect the corrupted USB flash drive to the computer. Step 1: Launch Bitwar Data Recovery software on your computer and select the corrupted USB flash drive on the program then click "Next". Step 2: There are three modes on this step to scan data out, you can choose "Quick Scan" mode first, If you cannot find files you want, try Deep Scan again. The deep scan will search every sector of the disk to find all existing files. Step 3: the program will ask you to select the file types, if you have no idea about which files you want, choose "Select All Types". Then click "Next" to start scanning. Step 4: After the scan, filter the scanned files by file name, type, path and time on this step. Then double-click the file which you want to preview them to make a selection. After determined, click the "Recover" button to save it to the hard drive or other normal external device. Complete the above steps and the corrupted USB flash drive data has been restored. Then you can Fix/repair corrupted USB flash drive using CMD command prompt. Fix/repair corrupted USB flash drive using CHKDSK command. Chkdsk command will scan and repair for both logical errors and bad sectors. If it successfully fixes corrupted USB flash drive, your USB flash drive will be usable again. Step 1: Plug in your USB flash drive to your computer. Step 2: Go to the start menu, type in "cmd" in a search bar, hit enter and then you can see something named "cmd. exe" under a list of programs. Step 3: Right click "cmd. exe" and select "Run as Administer". Step 4: In command window, type in "chkdsk /X /f USB flash drive letter:" or "chkdsk USB flash drive letter: /f ", for example, "chkdsk /X /f G:" or "chkdsk G: /f" to start to repair damaged USB flash drive. 3. It marks found bad sectors as 'bad'. This helps Windows understand not to store data at bad sectors to avoid data loss. 4. Do not use parameters with CHKDSK if you don't know how parameters work. 5. Close all files, programs, and folders before running CHKDSK utility. If you don't follow this rule, you may lose data or damage your hard drive file system. CHKDSK is a useful utility that can help you keep your hard drive healthy and detect issues before it fails. However, if you ever face any data loss situation due to any reason, use Bitwar Data Recovery to recover deleted/formatted/lost data from a hard drive or external storage drive. Summary：Bitwar Data Recovery for Mac can help you to recover data from external hard drive on Mac OS X. It is the best external hard drive recovery software for Mac. Summary：Download alternative to free Lazesoft Data Recovery full version Crack with latest keygen, serial number, registration code, license code to recover videos, images, documents, music , etc.